As recently as the 1940s, a beachgoer to the shores of the Pacific Ocean in Los Angeles County could have encountered the shallow depression and eggs that make up the nest of a Western Snowy Plover. The egg collectors of the late 1800s and early 1900s gathered up and vouchered eggs at Los Angeles County locations down the coast from Malibu to Santa Monica, Playa Del Rey/“Ballona Beach,” Redondo Beach, and Manhattan Beach. In addition, nest locations included the salt pan of the Ballona Wetlands and around the freshwater wetland system of the south bay that has its remaining manifestation at Madrona Marsh. Sixty years later, in 2006, the Audubon chapters of the Los Angeles County coast embarked on a volunteer science effort to understand the continued wintertime use of the beach by these tiny shorebirds. Old habits are hard to break, and despite the lack of nesting habitat caused by the disturbance of urban beach use and grooming, plovers return to Los Angeles County shores each year until departing for breeding grounds. For a decade now, volunteers led by LA Audubon biologists Tom Ryan and Stacey Vigallon have undertaken a periodic census of these threatened birds, documenting their roosts and habitat use on some of the most well-loved and used beaches in the country. With knowledge about the locations of the seasonal roosts, Los Angeles County Department of Beaches and Harbors and the California State Parks have established fenced exclosures to protect the birds during the winter. Together, Los Angeles Audubon, Santa Monica Bay Audubon, and Palos Verdes/South Bay Audubon have collaborated with State parks to maintain an exclosure at Malibu lagoon since 2008 and with Beaches and Harbors to maintain an exclosure at Dockweiler State Beach since 2010 (including year-round trash removal). The program, funded by a number of sources (from California Department of Fish and Wildlife to the Disney Worldwide Conservation Fund) has grown, with 60–100 members of the public participating each year in plover-themed beach walks, hundreds of volunteers participating in the counts over the years, and thousands reached throughout the County from tabling events, presentations, and online resources. We have developed educational materials for beach managers, and provided maps and a beach driver habitat to help Beaches and Harbors to ensure that those with permission to drive on the beach do not kill these federally protected birds. Sadly, “roadkill” mortality does occur and local Audubon volunteers have documented it. Since development of the driver handout and outreach to agencies, the number of vehicles seen speeding on the beaches has declined. This program has also built local conservation capacity, with three young professionals recruited and trained through the Environment for the Americas program who are now employed by LA Audubon to work on monitoring and outreach tasks for Western Snowy Plover and our other endangered beach-nesting species, California Least Tern. 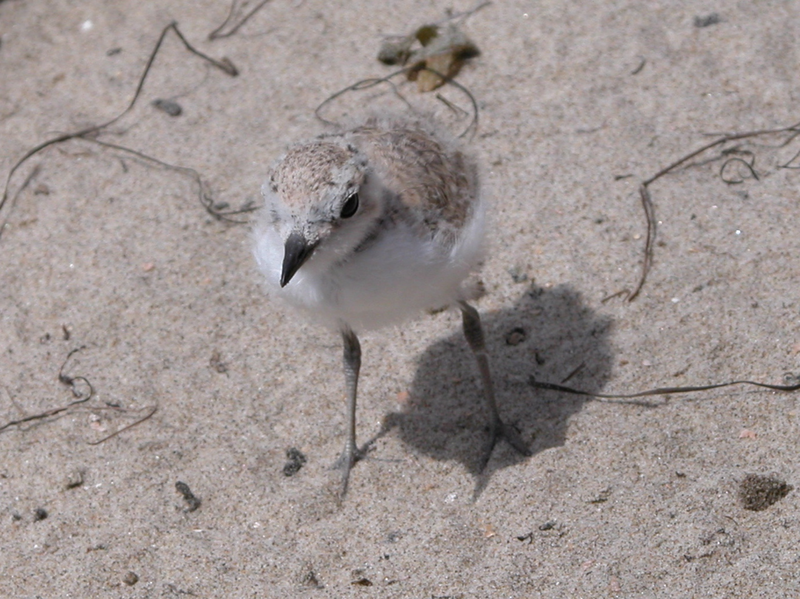 A hatchling Western Snowy Plover at Coal Oil Point, Santa Barbara County (in captivity being rehabilitated). The exciting thing is that wintering sites, with proper management, can be converted to breeding sites. The managers of Coal Oil Point, at the northern end of UC Santa Barbara, established a year-round exclosure and successfully encouraged nesting by Western Snowy Plovers after years of wintering-only behavior. Our volunteers and staff have documented scrapes in the sand in Los Angeles County that indicate the first steps of nesting. The frequent grooming of Los Angeles County beaches, however, is an impediment to Western Snowy Plovers nesting once again, as are off-leash dogs, and large events at roost sites. The US Fish and Wildlife Service, which is responsible for protecting federally endangered species, wrote a letter to the various agencies managing Los Angeles County beaches earlier this year. 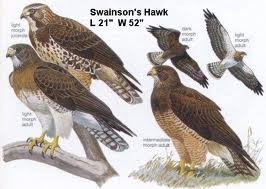 In this letter, they cited the years of work done by local Audubon chapter volunteers and staff and established a set of “Special Protection Zones” within 500 feet of each of the main roost locations that we have mapped. These zones must be protected from plover arrival in July until departure the following April or May at all of these zones except at Surfrider Beach in Malibu where the zone is to be protected year-round. This is tantalizingly close to year-round protections for plover roosts throughout Los Angeles County. Those who have been involved in this program deserve congratulations and our appreciation. Their work has laid the groundwork for a possible recovery of Western Snowy Plover in Los Angeles County. But much is left to be done. The roosts must be protected by all parties — unfortunately a volleyball court was built in the middle of a known and documented roost at Zuma Beach, and that mistake should be reversed. The potential for inland nesting at the salt pan at Ballona Wetlands Ecological Reserve should be acknowledged and that habitat protected and managed for this possibility. If and when an intrepid plover makes another scrape on a Los Angeles County beach and lays an egg, we should stand ready to celebrate and ensure that Angelenos work with us to see fuzzy puffballs of plover hatch once again in the county. Reprinted from Western Tanager, 83(2): 6–7 (November/December 2016).